Mountain States Kitchen & Bath is the supreme full-service kitchen cabinets and custom cabinet provider for homeowners in Utah. Enjoy unmatched service, quality and pricing for all your new custom cabinets, kitchen remodeling and upgrade needs. Many homeowners in Utah consider their kitchen the most important room in the home. It is a high traffic area where meals are created and enjoyed, game nights take place and holiday memories are made. However, this room and everything that happens in it can be even better with the help of Mountain States Kitchen & Bath. Consider this locally owned and operated company your magic wand, turning the kitchen, bathroom and any other area of the home into a stunning showstopper. Looking To Remodel Your Kitchen Cabinets? Expert design consultants are available to work with homeowners to design a one of a kindcustom kitchen cabinets and bathroom cabinets. This is both an exciting and overwhelming process. A lot goes into even “just” a cabinet or granite countertop upgrade, let alone a brand new construction, complete kitchen remodel or bathroom overhaul. Mountain States Kitchen & Bath’s expert designers walk clients through the entire design and new construction or remodel process. However, it is not only about beautifying your Utah home and instantly raising its value. A better room means more functional and efficient home living. Consultations are always complimentary and include no pressure. Mountain States Kitchen & Bath features the best custom cabinet designers in Utah and in the industry. Contact our team of design professionals today to schedule a meeting and free estimate. There is a variety of products and options available, allowing for the possibility of a budget-friendly remodel or update. Select from a number of custom cabinets, bathroom cabinets or design a complete kitchen and bathroom remodel. Homeowners who envision a more open space can also depend on a professional, licensed crew to remove unwanted walls and create a brand new look for your home. This locally owned Utah cabinet company is Gephardt approved, which means premium customer service. Find out more about the Bill Gephardt approval and the $1,000 guarantee today. 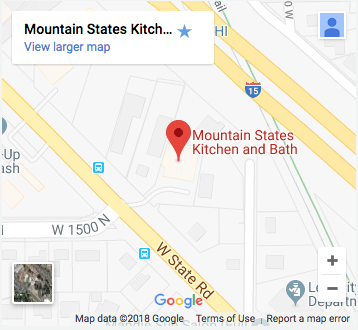 According to Bill, Mountain States Kitchen & Bath meets his high standard of business conduct, and he is one of many who consider our company Utah’s leading kitchen re-modelers and bath renovators. A flawless Better Business Bureau (BBB) rating, Gebhardt approval and hundreds of happy Utah customers cannot be wrong. Cabinets and granite countertops are the frames of a kitchen and can make a huge difference. Kitchen cabinets should be both beautiful and functional. This kitchen needs to be easy to clean and sanitize while also being highly durable. Bear in mind that kitchen cabinets get serious workouts while putting up with a lot of heat, humidity, moisture and general “wear and tear”. Today’s popular custom kitchen cabinets are highly desirable by many Utah homeowners, which means when remodeling their kitchen, they will take down a wall or two for more custom cabinet space. Remodeling your kitchen with custom cabinets can increase the value of your home. Whether homeowners want a kitchen remodel, new custom cabinets, granite countertops, the removal or addition of a kitchen wall and a complete kitchen and bathroom custom remodel—you can depend on Mountain States Kitchen & Bath of Utah to deliver. Our custom design experts excel at working within your budget and the inventory available is impressive. Hand select the perfect custom materials for your tastes and budget while enjoying peace of mind knowing that this locally owned Lehi, Utah company has a perfect record among clients and industry experts alike.